Galvanized steel pipe—not to be confused with thin-wall steel tubing or conduit—isn't as hard as cast iron and can be cut with a saw or a steel pipe cutter, which is similar to a copper pipe cutter but is heavier-duty. 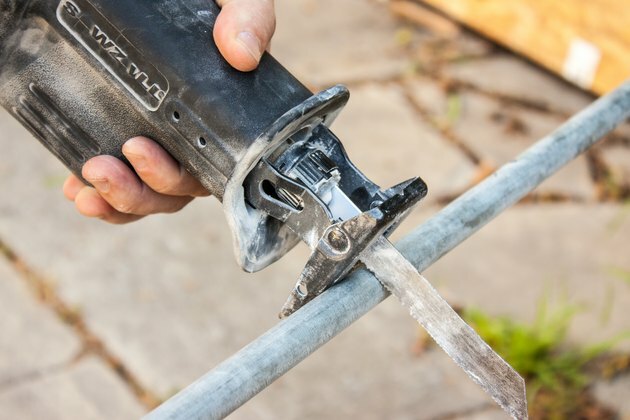 A pipe cutter is easier to use and makes a cleaner cut than a saw, but when a pipe is tucked into a tight corner a saw may be your only option. 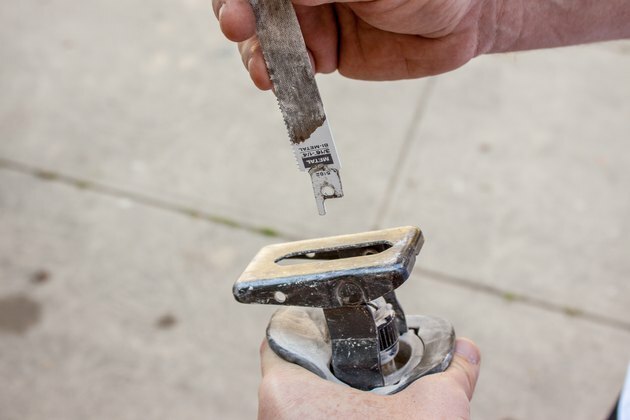 Keep in mind that any cut on a threaded pipe means you'll have to get the newly cut end threaded or use a special coupling that doesn't require threads. Install a 6-inch metal-cutting blade on a reciprocating saw. Hold the saw so that the foot (the metal plate near the bottom of the blade) is in contact with the pipe and the blade extends across the pipe. Holding the saw this way minimizes vibrations that make cutting difficult and can loosen pipe supports and fittings. There may not be room to do this if the pipe is in a corner. In this case, keep enough space between the foot of the saw and the pipe to prevent the tip of the blade from hitting nearby objects. At the same time, if the foot is too far from the pipe, the blade might retract back into the cut and stab at the pipe on its outward stroke. It's best to keep the blade length centered over the pipe. Keep steady forward pressure on the blade while the saw is in operation. You may have to change the orientation of the saw as the cut progresses to prevent the end of the blade from hitting the wall or any nearby framing. Stop the saw just before finishing the cut and bend the pipe slightly to open up the gap and help prevent the saw from binding. Finish sawing in the same direction to complete the cut. Tighten the pipe cutter around the pipe by twisting the screw gear clockwise. Use a pipe cutter only when you have clearance for it to spin around the entire circumference of the pipe. Rotate the cutter completely around the pipe. When the blade returns to its starting point, tighten the gear a little and make another rotation. Continue tightening the gear as you rotate the cutter around the pipe until the pipe is cut through. This may take 10 to 15 complete rotations.